Asiana Airlines Interview – Hello everyone welcomes to Aviation Dreamer. If you want to become a cabin crew in Asiana Airline then this information is really important for you. 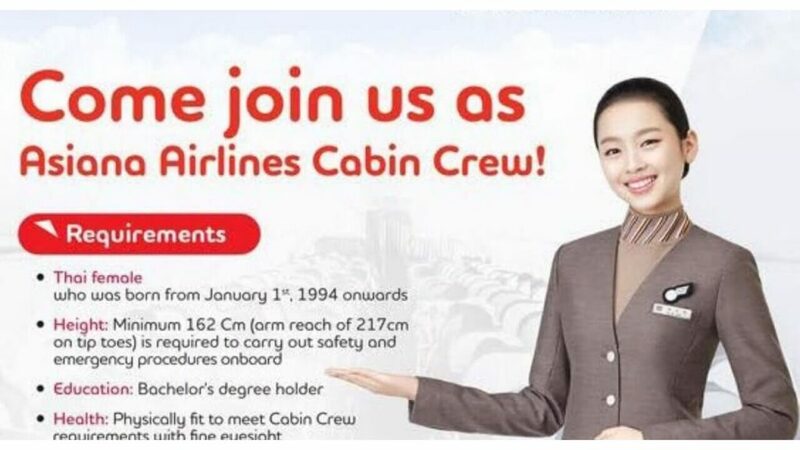 You should know about the Asiana Airlines Interview Process for Cabin Crew. So requested to all please read this article till the end. Established in 1988, ASEANA Airlines is one of the two major airline brands in South Korea. Owned by Star Alliance, the company employs approximately 10,000 people and has a fleet of about 80 planes. It offers domestic, international and cargo flights for around 90 destinations. Asiana Airlines remained a # 6th place in the world’s top 10 airlines the year 2018, which was awarded during World Airline Awards on July 17 last year. For this reason, many travelers and job hunters started keeping their eyes on the company with an increase in their accomplishments. The company is really competitive, especially when it comes to their performance because their number one priority is the safety and comfort of their passengers. Now, since Aasia Airlines is getting more recognition recently, you should take your game to the next level. You can do this by researching the company’s history and values so that you can align them with you, prepare them for the potential questions they can ask you during the interview, and collect all those necessary documents. Which you may need as soon as possible. In our previous post, we have shared detailed information about the requirements of Asian Airlines for this situation. Just to give you a brief summary, the company did not list several qualifications different from the basic requirements such as the degree and the passing TOEIC score for basic needs. To attend their interview just you need to apply online and send your resume to them from there official website. Then the airline hiring officer will contact you to ask you to participate in the group interviews. So, below are the 3 interview rounds which you have to face. For this event, you will be divided into small groups with other applicants for the introduction part. This is a chance to show your degree or past experiences that will be relevant to this situation. If you catch the interest of management, then you will be asked to come back for the next step. This is the test phase where your skills will be assessed individually. It may include tests about your proficiency in the Korean language, your personality and more. Now, this part is really important because it will have a huge impact on the outcome of your application. While working in the customer care area, you will be asked questions about your performance and attitude with your experience with Korean culture, and much more. A good tip is that you should always be confident and look as much as possible in the interviewer’s eyes. If you pass all these, then you will go ahead for the medical examination, which will be officially held before you are hired as Asiana Airlines cabin crew. Preparation is very important because the company is very carefully known for recruitment. Also, remember that dress appropriately during the interview and make sure that you are well prepared. Best of Luck for Your Interview. Hello, Everyone I am Paresh Baidya. And an Experienced Airlines Staff.Apart from that, I am a YouTuber and Blogger of AVIATION DREAMER. And I love to making video and writing on the different topic and my hobbies are listening to music and traveling through the country. © 2019 AVIATION DREAMER. All rights reserved.